Keane's most recent single release was 'Tear up this town', a track for the feature film 'A monster calls'. This picture disc single was released on Record Store Day in 2017, a few months after its digital release in September 2016. The picture disc only has one track; the B-side is blank. 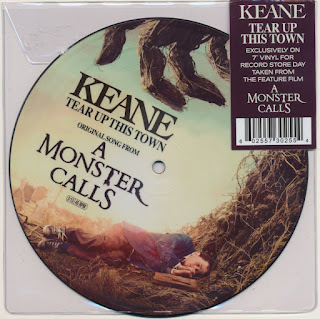 It looks like this single is the last one Keane has released, as they went their separate ways. Singer Tom Chaplin went solo, while Tim Rice-Oxley started the project Mt. Desolation together with fellow Keane band member Jesse Quin.